For over 100 years, people have gathered at Navy Pier in Chicago to experience the Windy City vibe. 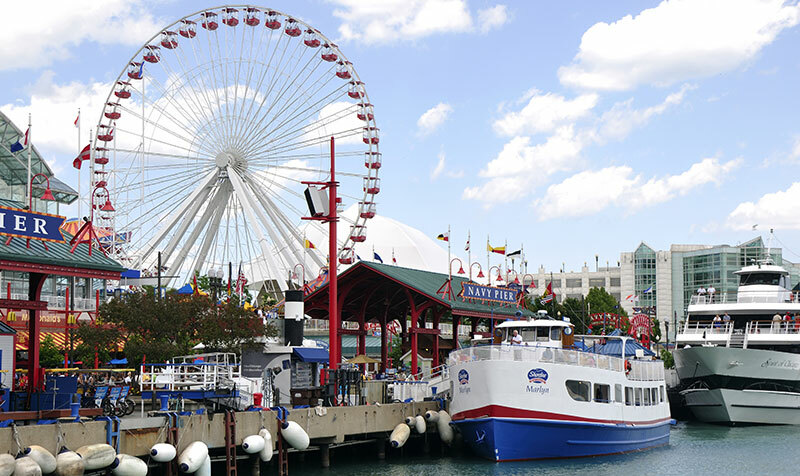 Located on Lake Michigan, Navy Pier includes fifty acres of gardens, parks, restaurants, shops, entertainment and attractions along the waterfront. Families can enjoy shopping, art exhibits, theatrical performances, concerts, festivals, and daily cruises on the Chicago River and Lake Michigan. Soar to 200 feet on the giant Centennial Wheel with amazing views of Chicago and the lake. Kids love the Chicago Children's Museum and the Navy Pier IMAX® Theatre with immersive movie experiences. See vibrant plays at the Chicago Shakespeare Theatre, or cruise, dance, eat and take in the beautiful skyline on the Spirit of Chicago. Navy Pier also offers unique waterfront restaurants, including Bubba Gump Shrimp Co. and Jimmy Buffet's Margaritaville, a diverse food court and outdoor dining spots. What are the hours for the Centennial Wheel at Navy Pier? Soar to more than 200 feet above Lake Michigan on the Centennial Wheel and enjoy panoramic views of the city. Enjoy the ride from 10:00 a.m. to 8:00 p.m., Monday through Thursday; 10:00 a.m. to 10:00 p.m., Friday & Saturday, and 10:00 a.m. to 7:00 p.m. on Sunday. The wheel is climate controlled throughout the year for your comfort. Where can I find a schedule of events at Navy Pier? Navy Pier is bustling with events, festivals, cruises, theater performances, art exhibits, festivals and cultural experiences all year long. To find out what's happening on the Pier today, just visit their website and check out the Calendar of Events. There you can find out not just what's going on right now, but what's coming up, too.